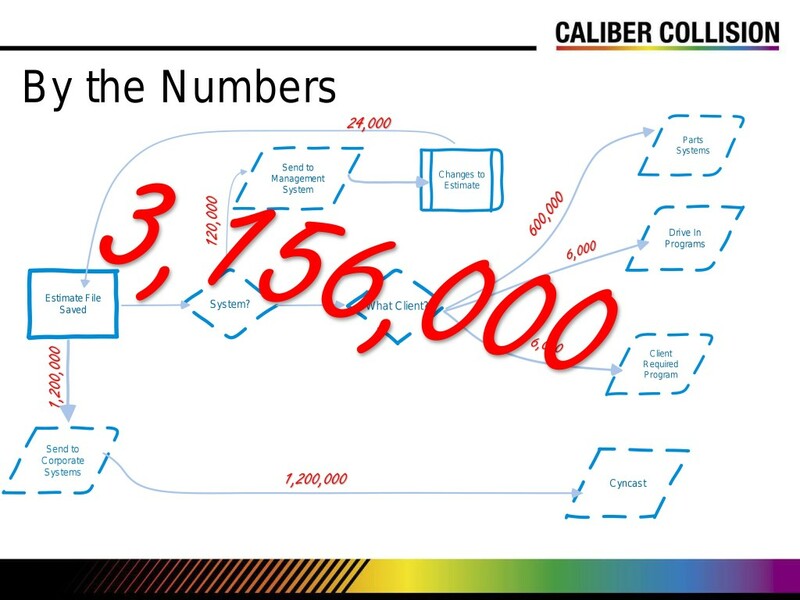 Caliber Collision’s head of IT last week called on software vendors — including the three major estimating services — to support more efficient and secure collision repair data transmissions. The comments from one of the nation’s largest auto body shop chains were perhaps one of the loudest demands yet that vendors cease practices like indiscriminate data pumps and embrace CIECA’s modern Business Management Standard rather than the ancient Estimate Management Standard. Last year, CIECA Executive Director Fred Iantorno urged smaller shops to demand Mitchell, AudaExplore and CCC provide them with access to the modern BMS outputs, noting that CIECA had made it easier to do so with a mapping setup. But Caliber information technology Vice President Ashley Denison seemed to indicate in a March 2 webinar that only CCC offered any real support — even at the MSO level — and it too could stand to improve. For example, a shop technician can develop an estimate and transmit relevant elements of it to an insurer, parts vendor and rental car service automatically so they can hold up their respective ends to serve the customer. Otherwise, the recipients would have to manually enter the data, wasting everyone (and the customer’s) time. The EMS system developed in 1994 was fine for its time, built to deliver dBase files in a largely pre-Internet world. But CIECA hasn’t supported it since 2003, focusing on BMS. To Denison’s knowledge, there hadn’t yet been a major data breach in the collision repair industry, but Caliber certainly didn’t want to be the one to break that tradition. “We at Caliber feel responsible and are responsible for that data only being in the hands of the true information providers for the client,” she said. CIECA describes EMS as a “flat file” versus a series of specific “messages” under BMS. Under EMS, all data related to an estimate is exported to a party who has requested information from a collision repairer — not just the portion needed to accomplish whatever businesses the auto shop needed to transact with that party. In BMS, each party only sees what they need to see. And that example involves a party to which a shop wanted to send data. It’s easy for another party’s “data pump” to capture all EMS messages, even if they’re not involved in all those transactions. “If we just put a data point on, it is going to pump everything through that pump,” she said. Caliber’s IT staff are forced to develop filters every time — something that’s probably not possible for smaller repair operations. On the other hand, Caliber’s size — more than 370 locations, according to Denison — makes the process terribly unwieldy. Installing and maintaining numerous data pumps on 370 shops isn’t an easy feat, she said. Say a single estimate produces 15 EMS files. Caliber shops produce about 40,000 estimates a month nationwide, and all of these probably need at least one change. All 1.2 million files are kicked over to corporate to curtail local data pumps, and another 1.2 million go to Cyncast for uses like rental cars. “We have to move all 15 files every time,” Denison said. Caliber uses CCC but has all three systems, and it must send files to Mitchell or AudaExplore about 20 percent of the time — another 120,000 files. About 600,000 more files go to parts procurement systems, and there’re a couple other “smaller” (the lowest is 6,000) barrages of files on average. 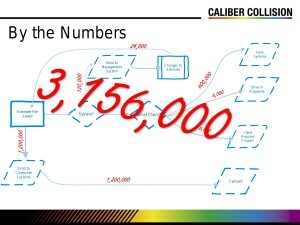 Put it all together, and Caliber is dealing with 3.156 million files a month, according to Denison, who called that September calculation a “very low estimate” considering Caliber’s growth since then. Caliber experiences frequent issues because of that complexity, according to Denison. “It introduces inherent risk that something is going to fail when you’re constantly moving all these workfiles around,” she said, The Caliber help desk calls such problems “one of our No. 1 issues,” she said. Denison said if everybody in this example converted to BMS, which only has a single file, the MSO’s transmissions in this example would be chopped to only around 210,000 files. “As each of the MSOs grow, that is a huge reduction in time and effort,” she said. PartsTrader and Caliber’s default Overall Parts Solution in particular “have totally embraced that MSO model” and helped the company find a more secure, efficient corporate-level solution rather than data-pump an individual shop. CCC now provides Caliber with BMS support for repair order data, which allowed the chain to even add another management system when they bought a decent-sized MSO, according to Denison. The company has begun providing BMS messages for estimate data, and “that’s going to open up a world of opportunity for us,” Denison said. But CCC, Mitchell and AudaExplore still hinder better data transmission by failing to use cloud technology — which all three have — instead of local data pumps and other “old technology,” according to Denison. This could help individual shops as well as MSOs, she said. “Quite frankly, its fine for me to talk about it, and … great for OPS to work with what they have, but unless Mitchell, Audatex and CCC ONE look at this to simplify it, we are going to continue to grow this problem,” Denison said. AudaExplore and Mitchell did not respond to a request for comment. CCC has supported BMS specifications for years and is continuously making more BMS messaging available to trading partners that utilize the CCC network to perform commerce. We are also expanding our capability with additional messages for trading partners that utilize the CCC network. 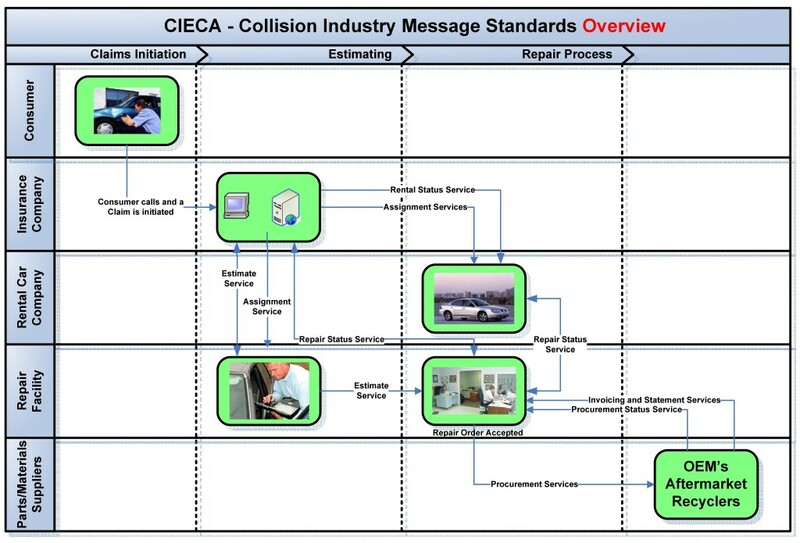 CCC is committed to advancing the CIECA BMS standards across its entire solution set, however we will do so responsibly to prevent disruption to our customers’ existing workflows. Many downstream applications that rely on the EMS standard today may not be prepared to take advantage of the BMS specification. Due to confidentiality provisions we have in place, we cannot speak to the specific implementations in use by a specific customer.